What is the Acer Predator Z35P? Ultra-wide gaming at its finest! Who can remember the 15” CRT monitors that were available to the PC gamer of the 90s? They used to weigh a ton, didn’t seem to last that long and were relatively expensive. Thankfully in the early 2000s the humble CRT monitor was put out to a much-needed pasture. The choice for today’s PC gamer is extensive with monitors ranging from basic 19” LCD models, through to all singing and dancing 30”+ featuring G-Sync, 4K and now even HDR. It wouldn't be hard to spend well over £1000 on the latest models. Our next review monitor is from Acer’s Predator range. 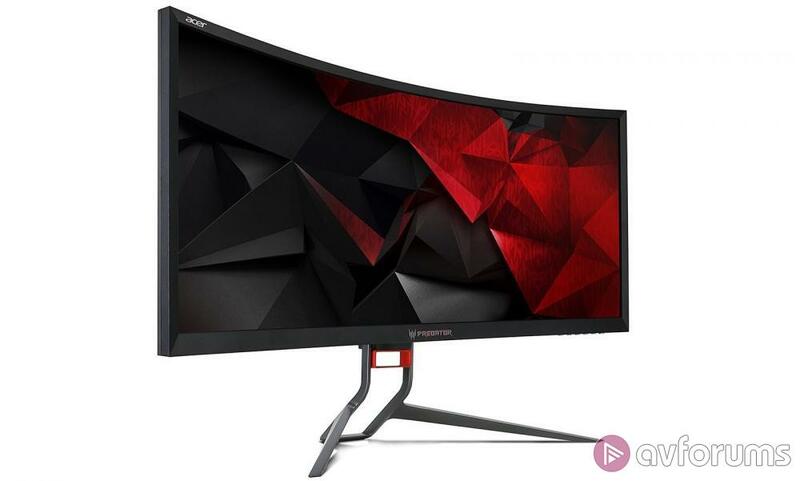 The Z35P is a beast of a monitor with a curved 35” display, a 3440 x 1440 Ultrawide QHD resolution and is feature rich including G-Sync, 4ms response time, 120Hz refresh rate and a VA panel that has up to 300 Nit brightness. Released in 2017 at well over £1000 it is now available for a less shocking £800. Our last Acer monitor review, the 29.5” curved Z1 performed well and offered a lot less for what is a very similar price. Read on to see if the Z35P offers enough to warrant spending £800 on a monitor…. 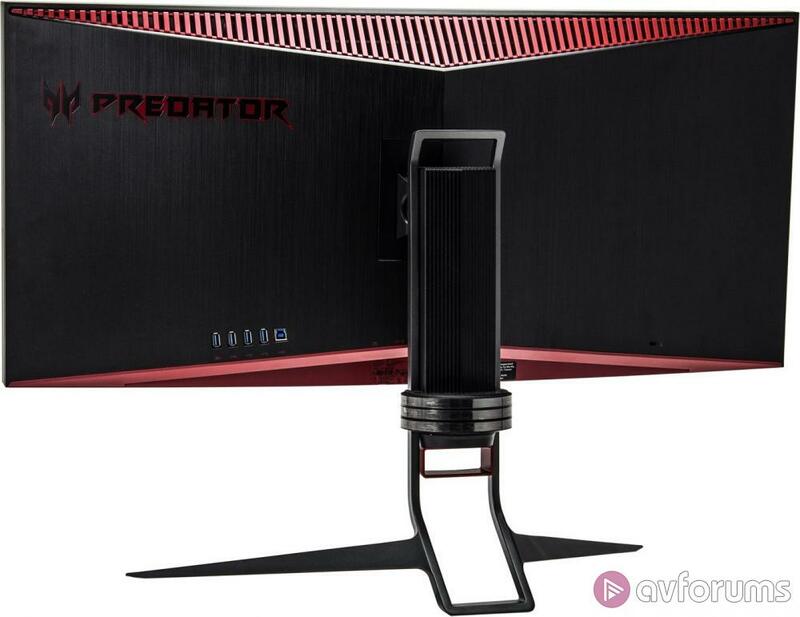 Released in 2017, the Acer Predator Z35P is widely available for just under £800, a good reduction from it’s £1000+ release price. 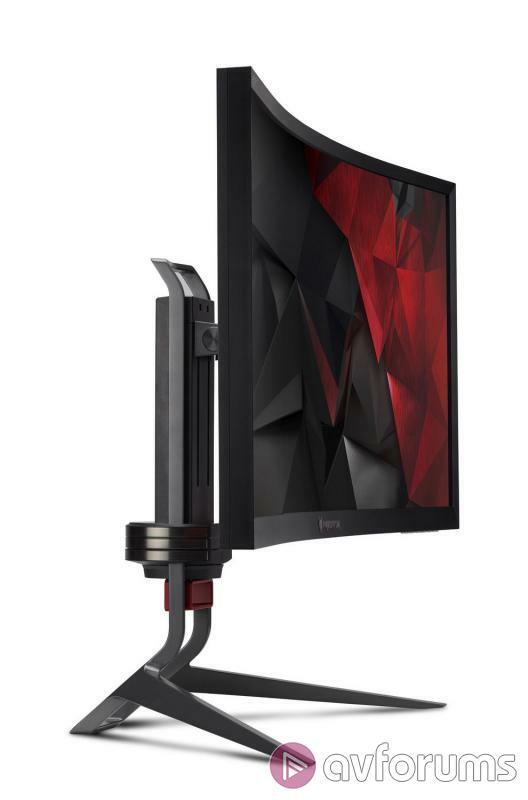 A hefty price still to pay for a monitor but it does have a tasty specification, which to get the best out of the 120Hz overclocked refresh rate you will need to use the display port connection, as the HDMI 1.4 port is limited to 60Hz. There’s no escaping the size of this beast. With the addition of it being a curved screen, you need to allow for a good chunk of your desk’s real estate to disappear. It measures 850mm wide, 465mm high with the monitor at its lowest point on the stand height adjustment and 580mm at the highest and including the huge stand is 310mm deep. The actual screen width is 815mm measured as a straight line. The Z35P keeps firmly to the Predator design ethos with flashes of red to the rear top and bottom of the monitor and to the lower part of the stand (both of which you will never see, but it's nice they've made the effort) along with the Predator logo to the front. Apart from that it’s all black including the stand, which as mentioned before is one of the most intrusive we’ve encountered, but then it is understandable given the size of monitor it is supporting. It does have a good range of adjustments including pan, tilt and height. The only real negative we have with the looks of the monitor is that the bezels are extremely thick. If you do find the stand far too big, the monitor is VESA mount compatible, but make sure you find one that can support it’s 9.4kg weight. The menu control buttons are all along the bottom right of the monitor together with a small LED power light. As with the Z1, this monitor acts as a USB hub including the USB 3.0 (upstream) port and 4 x USB 3.0 ports. The other connections are the Display Port, HDMI 1.4 and audio. All the cables are included in the box, so you won't require anything to get it all setup and running. The USB ports are all handily located on the rear of the monitor for easy access, but the power and display cable connections are on the underside of the monitor at the rear which makes it quite fiddly to connect up to. The menu system is almost identical to that of the Z1 we reviewed recently, but without the annoying fiddly joystick control, although the power button is identical in size and right next to the menu buttons which did cause a few monitor power offs when we were looking through the menus. 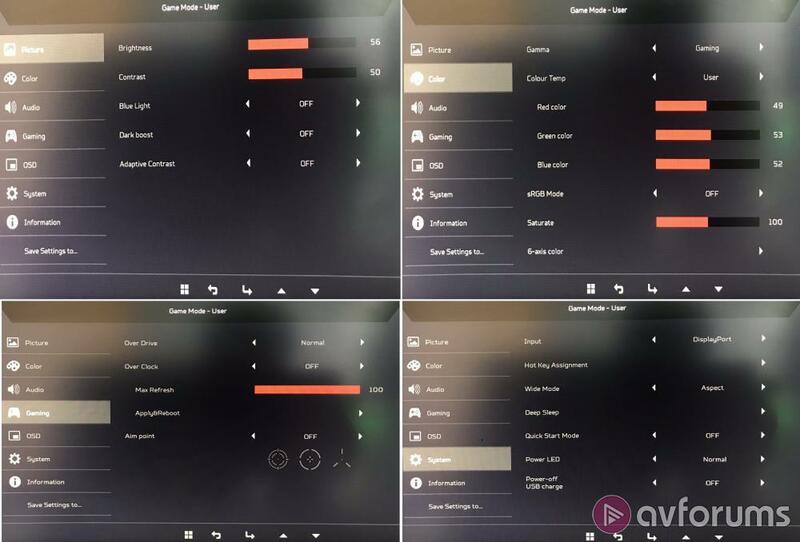 Pressing any button gives quick access to the preset screen modes, together with brightness, volume and input and the full monitor setup menus. Within the full setup menu you can configure basic and advanced picture settings including colour temperature and 6-axis colour settings. There are also settings for the overclock, on-screen display, USB charge and various other tweaks and adjustments. It's a comprehensive system that should allow you to tweak the monitor to your exact requirements. The maximum screen luminance detected was a 288.9 cd/m2. Following calibration, we reduced this to a more eye pleasing 190.2 cd/m2. Out of the box the monitor was already calibrated to a high level with a ColorChecker error of 2.21 and Greyscale error of 2.59. As a level of less than 3 is normally the target this would suggest no further calibration is required for the standard user. We calibrated it anyway to see just how good this monitor might be and achieved a superb ColorChecker error of 0.66 and Greyscale error of 0.53. For our testing we use a Leo Bodnar input lag tester. This measures the delay (latency) that it takes a video signal to pass from the point of input until it is displayed on the monitor. With the Z35P we get a result of 14.4ms. A slight improvement on the 16.5ms of the Predator Z1 and not far off our own Acer Predator XB271HU of 12.2ms and the Dell P4317Q we reviewed previously of 10.5ms. It’s important to note that input lag is not response time. Response time is often the headline number that monitor manufacturers use in their advertising, such as ‘very low 2ms’ for example. Response time is how quickly a display can change its pixels from black to white or grey to grey. A high response time will mean you are more likely to see ghosting, which is the blurring that you see behind fast moving objects. The Z35P has the same 4ms response time as the Z1, it’s not the best you will find with gaming monitors as some are now as low as 1ms, but for gaming will not cause any issues at all. When looking at a monitor’s specifications it is important to consider both the response time and the input lag. Monitor manufacturers never seem to display the input lag, with gaming for example a monitor with a 1ms response time but a 60ms input lag will likely offer worse performance than one with a 4ms response time and a 16ms input lag. The display itself with the huge 35” ultra-wide curved screen and the stunning 3440 x 1440 resolution is really something to behold. The 1800R curved screen may seem slightly odd at first, but you will very quickly get used to it and appreciate how much better in our opinion a curved monitor is for gaming. Unlike curved TVs which were just a gimmick, a curved monitor does makes PC gaming more immersive. The ultra-wide display is also a game changer in a lot of game genres such as FPS where you get to see a lot more of the play area. We tested in various titles such as Battlefield 1, PUBG and non-FPS games such as Rocket League and it gave a noticeable improvement on all of them. Most games now support Ultra-wide resolutions. It is also a benefit for general web browsing where you can have two or three browser windows on screen at once, or even have YouTube playing on one half whilst browsing AVForums on the other. The Z35P gives superb black levels, with a good deep black and a distinct lack of grey. Contrast levels were excellent and during our testing we suffered no issues with ghosting, even at the 120Hz overclock level. The overdrive setting is best to keep on the Normal setting though as on the Extreme setting we did start to notice a few ghosting problems. The colour reproduction is superb presenting clear and crisp text and vibrant images. Testing with various Ultra-wide videos highlighted just how amazing it looks. The viewing angle is listed as 178° and did appear much improved compared to the Predator Z1 including a gamma curve that was noticeably less apparent. A standard 1440P resolution can be fairly demanding for most PCs, especially gaming on maximum settings and normally the GTX1070 graphics card in our PC copes well with that and produces a high frame rate. Here with the increased 3440 x 1440 resolution our PC was given a damn good thrashing. With all settings on maximum, in Battlefield 1 we only achieved around 65FPS, 75FPS in PUBG (which admittedly is a very poorly optimised game) and only in the graphically undemanding Rocket League did we get a frame rate in excess of the monitor’s 120Hz overclocked refresh rate. A GTX1080 would be recommended if you are considering the Z35P. With the G-sync technology and the refresh rate coupled with the input lag, we suffered no issues such as screen tearing or any ghosting, the monitor performed admirably during our gaming tests. Should I buy the Acer Predator Z35P? £800 is a lot to pay for a monitor, but if you can afford it the Z35P gives you everything you need and more for the ultimate high-end gaming experience. Including a 35” 3440 x 1440 Ultrawide 1800R curved display, 120Hz refresh rate, 4ms response time and Nvidia G-Sync. With stunning blacks, superb contrast, vibrant colours and clear text it really is a joy to behold. The curved display adds a new dimension for gaming, increasing the field of view and the play area. A decent out of the box calibration also helps together with a reasonable input lag of 14.4ms. Compared to our last review of the £750 29.5” 2560 x 1080 Predator Z1, for just £50 more you can now get the Z35P with an increased resolution and much more screen real estate to play with, which makes it a very impressive looking package. The 30” plus monitor market is now quite competitive although add curved and ultra-wide into the mix and the choice becomes a lot smaller. For a monitor with near identical specifications you have Alienware’s much more expensive £1150 AW3418DW or Asus own PG348Q at £930.00. Sacrifice ultra-wide and you can get Acer’s own 32” 4K XB321HK with G-Sync V2 at just £599. But nothing currently is available to match the specification and price of the Z35P. Given the excellent performance and results the Z35P is a worthy winner of our AVForums highly recommended award. Write your Acer Predator Z35P Monitor review.